It’s hard for me to take in, but my Little C is going to Grade 1 in September. That means she’ll go to school every weekday. Oh, I’m going to miss this girl! She’s so excited – she can’t wait to ride the bus every day and see her friends more. She’s already counting down the days. Recently, we’ve started shopping for her back-to-school wardrobe. The other day I asked Little C what kinds of clothes she wanted to wear to grade one. “Clothes that no one else is wearing!” she said. My breath caught in my throat – this girlie is just like me! I distinctly remember having exactly the same attitude about my wardrobe when I was in school. It made me smile and nod with mama pride! 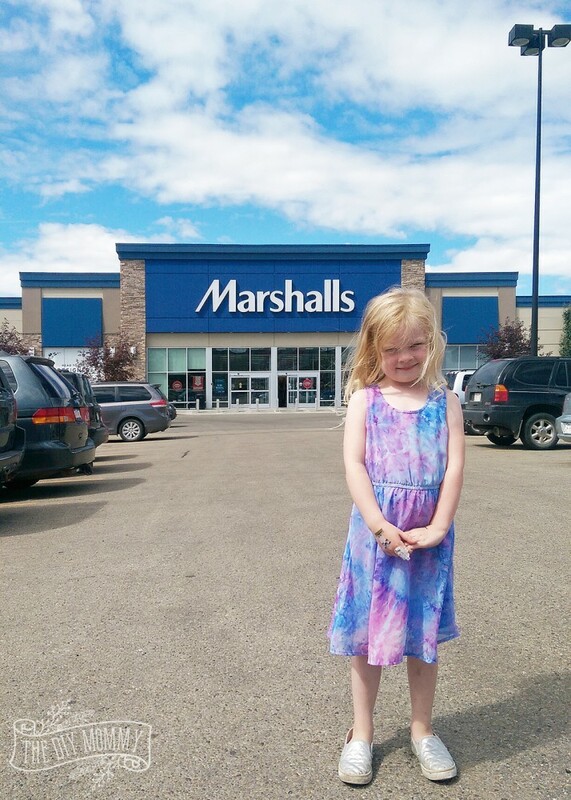 When I found out that there was a Marshalls in Edmonton, I knew it would be the perfect place to find just the unique clothes that Little C wanted for a price I’d be happy with. I absolutely love a store that features designer clothes and footwear for great deals! 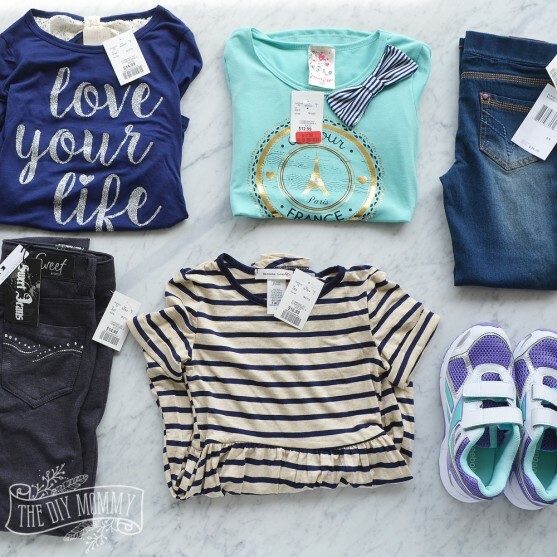 My girls and I took a special trip to The Big City to find Little C’s back-to-school wardrobe at Marshalls, and we found the cutest deals! 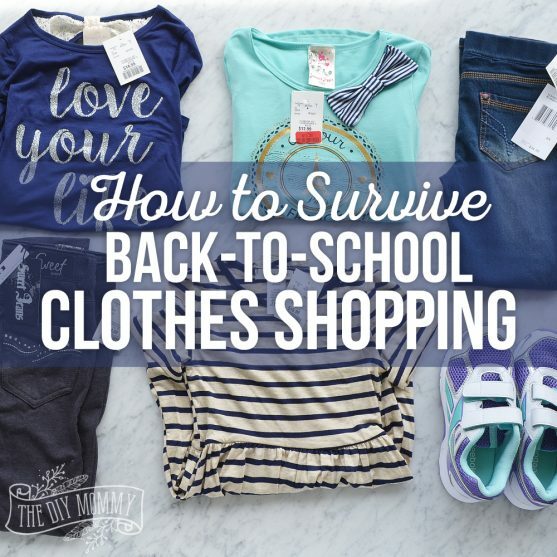 Let me share them with you along with some tips on how to survive back-to-school clothes shopping. Go through your child’s current wardrobe and make a list of what they need. I noticed that Little C already had a good selection of short sleeved T’s, so comfy pants and long sleeved shirts were what we were after. Choose one or two stores that you like best and limit your shopping to those. I like choosing places that have good quality designer clothing for great prices – along with a large selection – like Marshalls does. Make the shopping trip a special event. Planning the clothes shopping trip in advance and getting excited about it with your child makes them feel so celebrated – and it’s just plain fun! Pick items that have a similar colour scheme so that it’s easy to mix and match. Little C and I chose lots of navy and turquoise clothes that all look great together. 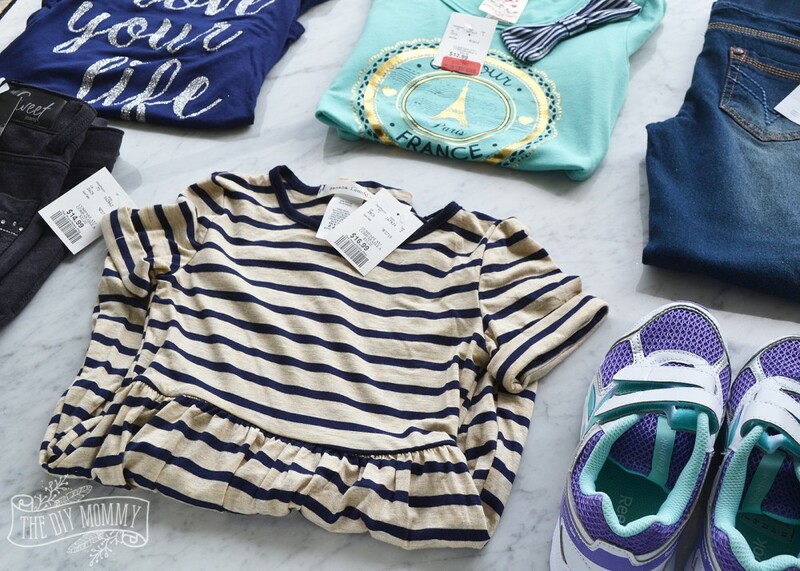 Little C simply loved her special back-to-school clothes shopping day, and we found the cutest deals! She’s been really into all things French lately after watching a couple of cartoons set in Paris, and we were able to find some adorable clothes that were French inspired and perfect for grade one. One of my favourite pieces is the striped dress in the center – isn’t it so Parisian? And at $16.99 (versus up to $32 elsewhere), it was an obvious choice. We also purchased a couple of wardrobe basics – like black stretch pants and brand-name jeggings – that every French girl should have in her arsenal. I was really impressed with the selection of shoes that Marshalls carried! 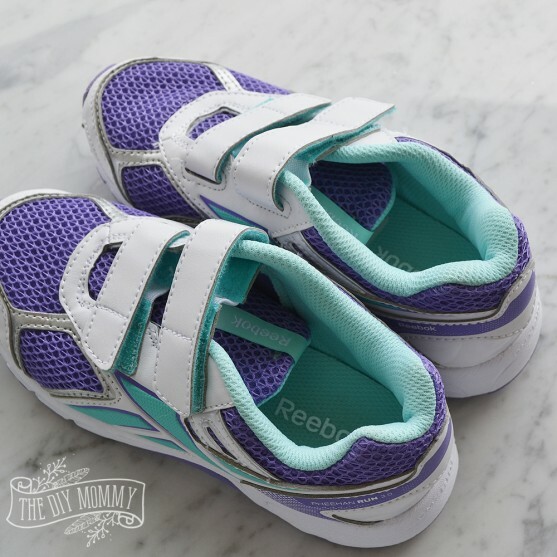 We found these brand-name sneakers that Little C tried on and immediately announced that they “would not give [her] a blister!” for a fraction of what they’d cost elsewhere. Little C’s new French inspired back-to-school wardrobe is now inspiring ME! I think I need an upgrade, so I might sneak off to Marshalls on my own soon for some “tres chic” new pieces for Fall. 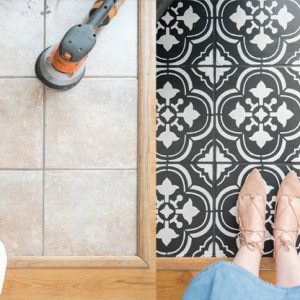 You can follow Marshalls on Facebook, Twitter and Instagram. Want your own chance to have a Marshalls Canada shopping spree? To enter for a chance to win a $100 Marshalls gift card, leave a comment below letting me know: What Back to School style are your kids looking for this year? This giveaway is open to legal residents of Canada (other than Quebec) who are eighteen (18) years of age or older and located in Canada (other than Quebec) at the time of entry are eligible to enter the Sweepstakes. Winners will be selected via random draw, and will be notified by e-mail. The notification email will come directly from BlogHer via the [email protected] email address. You will have 2 business days to respond; otherwise a new winner will be selected. Be sure to visit Marshalls brand page on BlogHer.com where you can read other bloggers’ posts! So cute. My girl going into grade 2 would love more dresses, she’s a girly girl, but also practical with the leggings to go with her dresses for the playground. Don’t use Twitter much, hope I got this right. This is awesome! I actually planned to do our back to school clothes shopping at marshall’s! They have great stuff for my almost teen and a good selection of well priced good quality shoes too. Yay! I love back to school shopping too! I am a teacher and it is a great excuse for new clothes!!!!! No kids and not in school, but still like to shop for back to school. Always was my favourite time of year. I do with casual and may find some grown up Reeboks for myself. I don’t have one in school yet, but it’s also time to get back into classes and since the spring she has outgrown all her clothes. We would look for twirly skirts for dance class and art inspired tops for art class and a new sweater or sweater dress for fall. Awesome haul, going to hit Marshalls this afternoon now! my kids are not into style much but they like Marshall’s a lot! It has to be Minion tshirts and jeans! My baby is starting kindergarten in September, she is unbelievably excited! She is all about dresses, and I am hoping to convince her she needs some leggings to go with those. She is looking for something comfy and girly like yoga pants and cute tops. My 5 year old’s requests for her wardrobe? Pink and purple everything! It makes me cringe a little, and I do manage to also sneak some neutrals in there, but I want to encourage her to discover her likes/dislikes on her own. My kids are looking for cute and comfortable clothes like leggings and cute sparkly shirts. My daughter is all about the comfort! She only wears comfy clothes and is liking more athletic type clothes. She loves the rockstar type clothes such as leather or jean jackets and loves leggings. She loves bright colors, especially pink! I don’t have kids but would say my cousins are looking for stylish patterns and comfortable styles. They are looking for skater style. This year I’m hearing about so many trends, and the school year hasn’t even started yet. That’s the power of the internet! So far accessories like sunglasses and booties top the list. My girls are looking for some cute designer jeans! Emma is fond of easy, comfortable clothes. Things that she can dance in at any time! They are looking for tops and pants in fun patterns. We always shop Marshalls for back to school. we like comfortable clothes and striped shirts! My daughter is going into kindergarten this fall and loves the graphic tees paired with jeggings. My son is older and is very conscious of his own sense of style. It doesn’t match what I would choose, but if he is happy, I am happy! Thanks for a chance to win! My kids wear polos and khakis for school! They can always use new jeans too. I also love that striped dress! Very Parisian, indeed. My son HATES clothes shopping, so he basically wears whatever I buy for him. I drag him along so that I know I’m buying the right sizes, but he has very little interest in clothes right now. He’s starting junior high this year, so I did buy him a faux leather jacket that he asked for. It was more than I’ve ever spent on a jacket, but I figure if it gives him a confidence boost for junior high, it’s worth it. He doesn’t know I bought it though, and I’m surprising him with it on the first day of school! My oldest daughter has a newfound interest in vintage hippie clothes. The “flower child” vibe suits her personality, so we found some cute floral headbands, peasant shirts, and a faux leather backpack. My youngest is starting kindergarten, and she basically just wants to look cute! She already had a good selection of clothes from her older sister’s hand-me-downs, but I bought her a couple of new shirt dresses. It’s so fun to see them so excited for school! We’re looking for plaid or cute shirts without any sayings on them, and bootcut jeans. She loves dresses and the color coral! I don’t have kids, but I’m looking forward to boots in the fall! My daughter loves fall colors and jackets. My son is only three, so style doesn’t matter. We just need anything that can be put on easily. The back to school style that I am most looking for this year is a cute kimono I love the coverage. My boys like comfortable clothes. They are not really too picky on styles as long as its comfortable. This year my son is into the skater style. My son likes anything to do with sports. My grandsons love sporty clothes. They like Disney and animal themed clothes. My boys like jeans and t-shirts and polos. My Niece likes Disney characters!